Thank you to all participant’s, supporter’s, and organizers who made Victims and Survivors of Crime Awareness Week a huge success. The week began with a media launch, which took place at Immaculate Conception School. Students worked hard to create a human mandala (depicted in the photo below). The students jumped, danced and ran onto the field to the sounds of Avicii’s Wake Me Up. 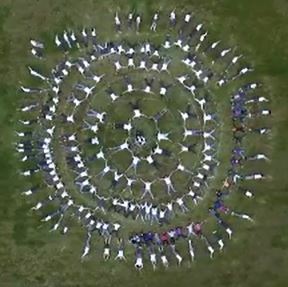 When the song was paused and all was silent, the students formed this connective shape, with only one student in the centre of the circle left standing. The human mandala was the first of multiple events occurring throughout Prince George between May 30th and June 2nd, 2016, for Victims and Survivors of Crime Awareness Week. The Gala event, which took place at the Prince George Golf and Curling Club, brought an end to the week’s events. We were privileged to have the Honourable Shirley Bond, MLA Minister of Jobs, Tourism and Skills Training and Minister Responsible for Labour; and, the Honourable Mike Morris, MLA Minister of Public Safety and Solicitor General, speak at this annual event. A human mandala is a geometric shape created using human bodies. This human mandala was created using students, grades kindergarten to seven, to represent the unity and connection of people who have been victims of crime, and to represent that no victim needs to suffer alone.